This composite photo shows the exotic galaxy Speca about 1.7 billion light-years from Earth. It is only the second hespiral, as opposed to elliptical, galaxy known to produce large, powerful jets of subatomic particles moving at nearly the speed of light. The spiral galaxy, dubbed Speca, boasts fast-moving jets of particles rushing from its center, a phenomenon more commonly observed in elliptical galaxies. In fact, Speca is just the second spiral known to have such jets. These jets are spawned by a supermassive black hole at the heart of Speca. Researchers hope studying the galaxy will yield insights into black holes, star birth and the interaction between the two. Speca — whose name is short for Spiral-host Episodic radio galaxy tracing Cluster Accretion — is found about 1.7 billion light-years from Earth. In addition to being a spiral, it's what's known as a radio galaxy. These relativistic jets aren't constant; they ebb and flow with time, likely dependent on the material that fuels them. Over time, the material diffuses into lobes, much as water flowing from a hose spreads out as it slows down. Most radio galaxies discovered to date are elliptical. Elliptical galaxies tend to be old, without a lot of new star formation, while spirals host much more star birth. So it's intriguing, researchers said, to find a jet-spewing spiral; studying Speca could help them better understand how spirals morph into ellipticals over time. "How black holes stop star formation is still not observed," Hota said. "Speca is an opportunity to investigate these details." This composite of the odd galaxy Speca about 1.7 billion light-years from Earth reveals the three pairs of lobes, as well as the parent galaxy. The diffuse purple blobs on the outer edges were reactivated by collisions with particles in space. The middle lobes dominate, but peering closely reveals the smaller set. Astronomers used a variety of telescopes to characterize Speca, finding that it boasts three pairs of lobes. Such a high count is rare even among ellipticals, and it provides clues about the evolution of Speca. According to Hota, the smallest, closest pair is most likely only a few million years old. The middle lobes fall between 10 and 100 million years old. But it is the outermost pair that yields the biggest surprise. With an age of several hundred millionyears, the cloud of material spewing from the center of the galaxy diffused long ago, becoming less active over the years. At some point, however, the material collided with energetic particles streaming throughthe galaxy cluster surrounding Speca. These collisions revived the ancient remnants, providing astronomers with a greater understanding of the environment within the cluster. The research was published in the August issue of the Monthly Notices of the Royal Astronomical Society. Spiral galaxies eventually transform into ellipticals, and Hota thinks the presence of jets may affect this shift. "What I believe is that this trend of radio galaxies found always in ellipticals and not in spirals is an end-product of multiple galaxy mergers and multiple episodes of jet feedbacks, happening over a few billion years time," Hota said. 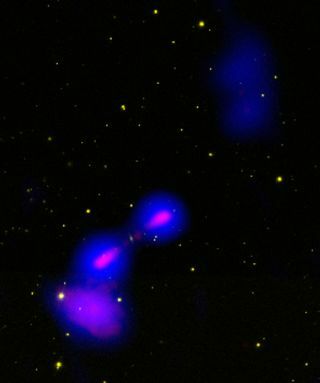 The two combined phenomonena would slowly consume the materials needed for star formation, allowing a spiral galaxy to morph into an elliptical. This meshes well with current theories about how ellipticals form; the ejection of material simply speeds the process along. "These jets are supposed to remove a large fraction of gas from a galaxy and stop further star formation," Hota said. "If the galaxy is gas-rich in the central region, and as the jet direction changes with time, it can have an adverse effect on the star formation history of a galaxy." Speca provides astronomers with an opportunity to study the effect of the jets on a young galaxy. Since they stem from the supermassive black hole at the galaxy's center, it reveals a connection between the powerful behemoth and the birth of new stars. "Once we understand how star formation and black hole activity evolved with time, we will have clues on the co-evolution processes," Hota said.